St. Gregory 'the Great' (c.540-604) was pope from 590 to 604 (responsible for sending St. Augustine to convert Britain to Christianity), and one of the 'Four Latin Doctors [teachers] of the Church'. About 850 of his letters survive in the papal register of his correspondence, which provide detailed insights into current affairs. 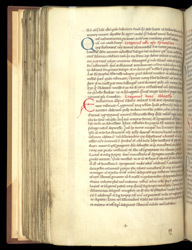 This manuscript was owned by the 14th century by the abbey at Bury St. Edmunds, and had probably been written there. In the left margin next to the red initial 'E' is a colour-note 'r', indicating to the artist that the initial should be executed in red. In the lower margin are a quire-signature in the form of a letter '.k.' (numbers are more common than letters), and a 12th-century sketch of a man's head.